Santa Fe Internet is an affiliate partner with Santa Fe, NM, based company Sun Comm Technologies Inc. for Satellite TV services for both DISH and DIRECTV. The company is an authorized dealer for both companies and has been since 1994, right when both DISH and DIRECTV went into business providing TV programming using satellite TV technology. As a Sun Comm Technologies affiliate partner Santa Fe Internet is able to provide customers all of the TV programming packages offered by the company from DISH and DIRECTV. DISH definitely offers supreme value and premium TV programming combined with low 100% digital prices across Santa Fe, NM, and throughout the State of New Mexico. It doesn’t matter if you’re wanting a low number of channels or large selection and dozens of channels, when it gets right down to it Dish has the right package and pricing for everyone in Santa Fe, NM, and all over New Mexico for TV programming. 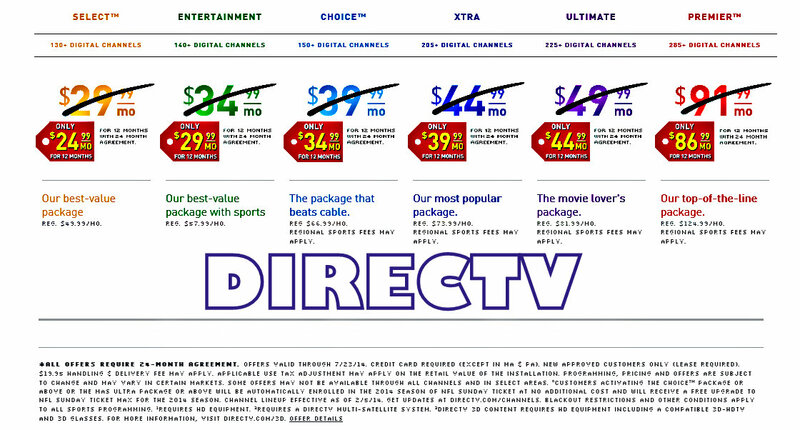 DIRECTV offers the most HD channels out of any of the TV programming providers today. Other providers state that they have the most HD channels, but it is not true and the actual numbers prove that it just is not the case. DIRECTV has over 190 full-time HD channels, which is definitely more than any satellite TV or cable TV or on-line provider.